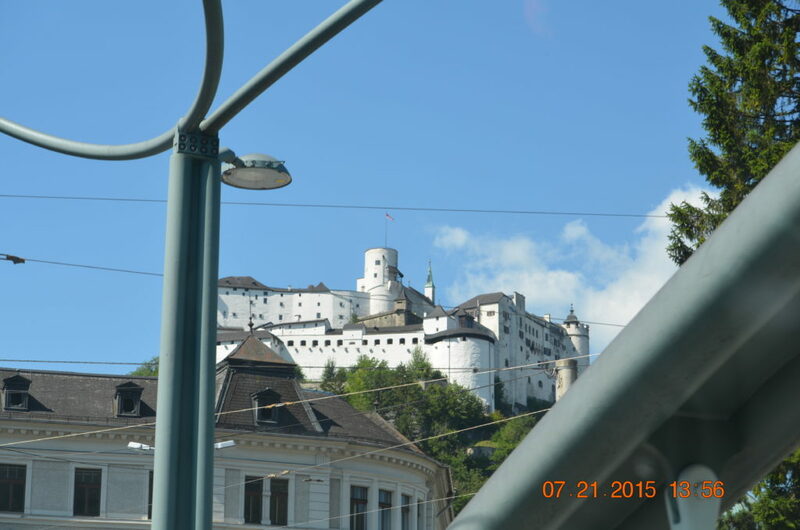 Thus, despite my life-long bucket list dream of seeing either hill or house, we opted for the Mozart residence and the Fortress Hohensalzburg as the two, primary destinations for our first trip to Salzburg. 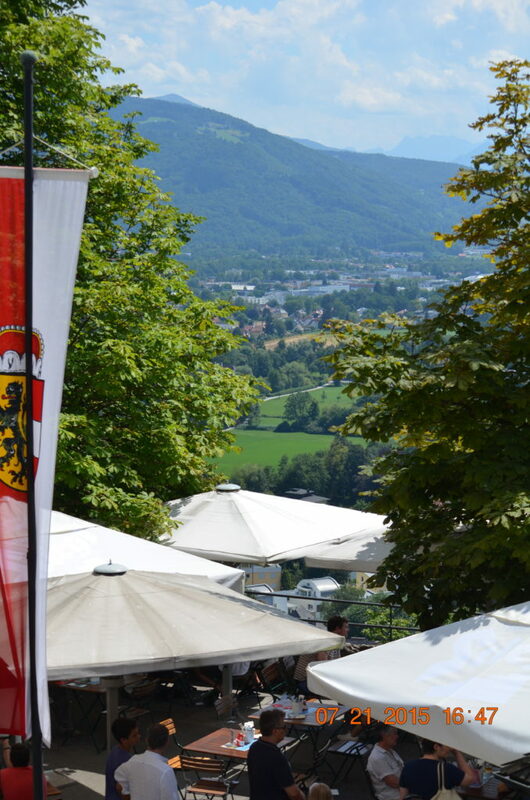 In our upcoming trip, we intend to take in more locations in and around the area, including Lake Mondsee, but we are going back to the two destinations because we simply can’t get enough. This imposing castle on the hill wasn’t one to pass up. 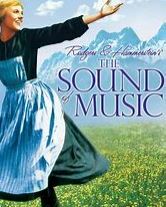 Like Lake Mondsee, we found it by chance; the focus on Mozart and the Sound of Music tours changing the moment we caught our first glimpse of the enormous, white structure. Rog immediately started looking for street parking at the base of the Fortress, in town, and got lucky. Our walk was only five minutes to the base of the hillside entrance. Once at the Fortress, you can take several different routes to see the expansive structure. Cafes and mini-restaurants are located on multiple levels and areas. The fortress has many landings offering panoramic views of the valley’s below. Restrooms were plentiful (thankfully) but it was quite hot; the only shade was found in the restaurants. After this trip, we purchased combo water-spray bottles to keep us cool. Even though the trams were full, the main fortress seemed almost empty because of the size of the area, reminding us of Czesky Krumlov in the Czech Republic. 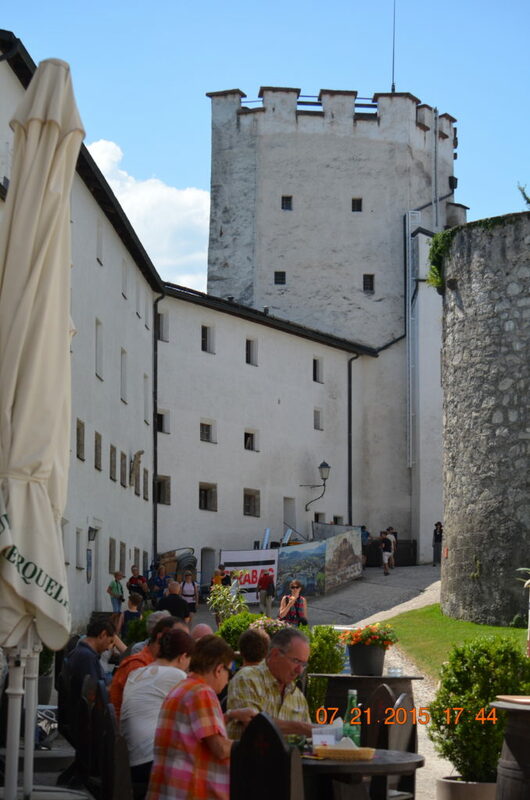 Yet, unlike Krumlov, Fortress Hohensalzburg has a mercantile, selling some of the best products we’ve seen. Unlike the silly shirts, hats or other items commonly sold, this mercantile had homemade soaps and honey, cream and wooden crafts. We spent nearly as much time in the store picking out items as we did the Fortress (well, almost). For thirteen dollars, we paid a visit to the residence of Wolfgang Mozart. 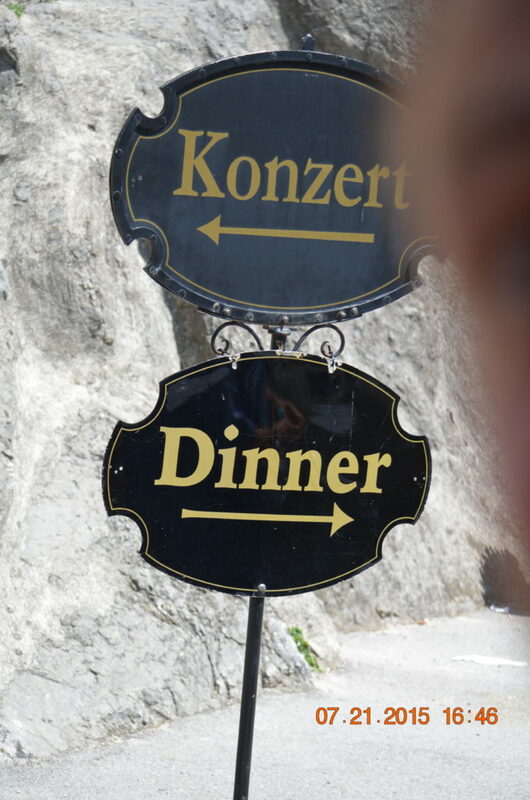 While the inside is identical to the pictures on TripAdvisor or elsewhere, nothing replaces walking through the very home where Mozart created many of his masterpieces. The surrounding area is full of eateries and gardens, so one doesn’t feel obligated to rush in and out of the neighborhood. Parking was easy to find as well (right across the street). Mozart was baptized in this cathedral the day after his birth, but it was historically relevant long before. 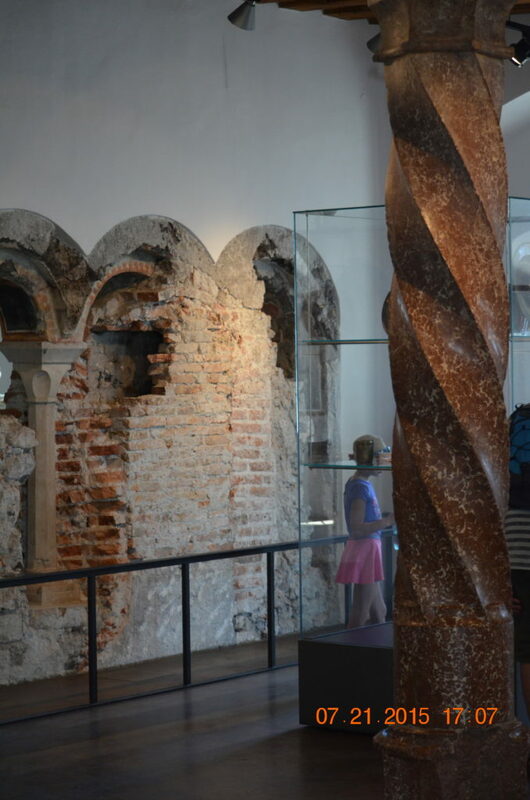 The first Dom was recorded in 774, a fact completely lost on my girls because the center was hit by a single bomb during World War II, and has been largely reconstructed. Still, it’s a beautiful structure if you are in to comparing cathedrals (which we are—it’s sort of become a trivial pursuit-type family pastime…which one do you like best? Why? What do you think of the pipe organ? The tiles were better…. you get the picture). 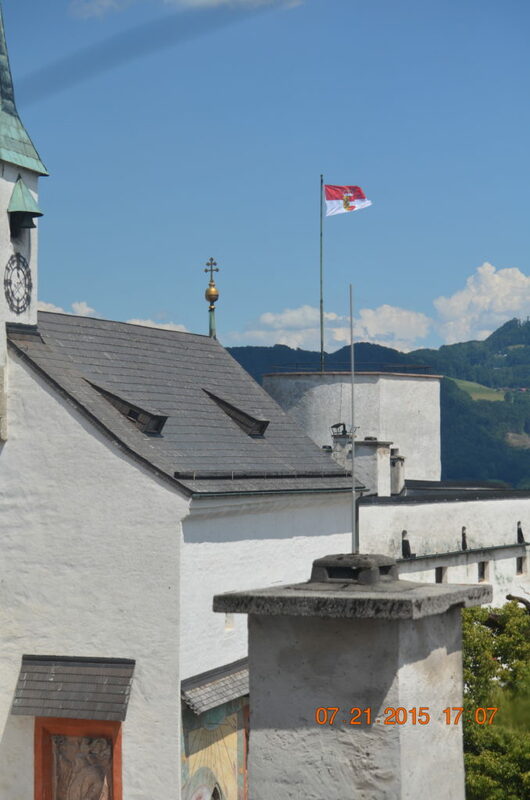 Depending on the month and week/day, festivals about in Salzburg, but we seem to miss most of them, but fortunately, not all. Check the calendar for your trip because the local food and culture really come through during these festive times. We had great luck with parking around the cathedral. Street parking a two blocks away made the short walk quick and easy. In fact, no matter where we went in Mondsee or Salzburg, parking was no problem. In Vienna, we didn’t bother look for street parking, we go straight for the closest garage and call it a day. This small-ish town has much to see and experience, but these were our higlights, and the best for kids <10. And in the end, I was able to see the Mondsee Abbey where the famous wedding scene between Captain von Trapp and Maria took place, which was cool. The mansion, hills and singing at the top of my lungs will have to wait for my next trip.